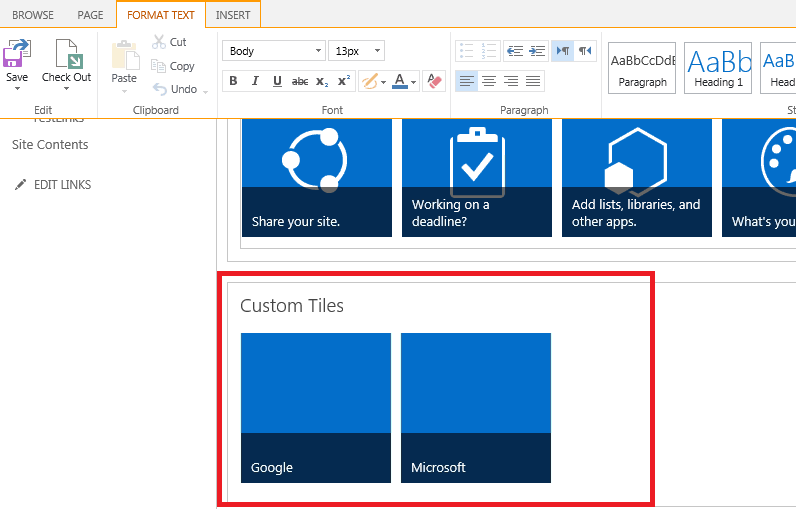 SharePoint 2013 site home pages has a Metro Tiles menu. Have you ever wondered if we can create custom Metro Tiles for our purpose. Yes we can do this.Below is how you do that. 5) Click on the newly create App list. 7) Enter the values as shown. I have left the background image location as blank. 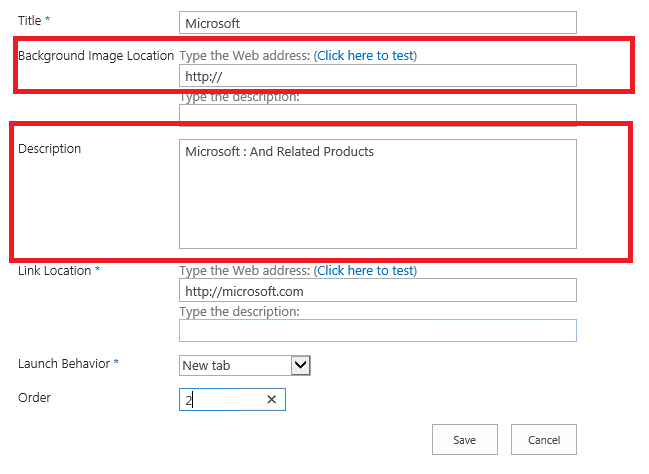 If you wish to have a background image for your tile, please upload an image to the Site Assets library and provide the web address in the below marked area. When you click on the tile, the description in the marked area would become active. 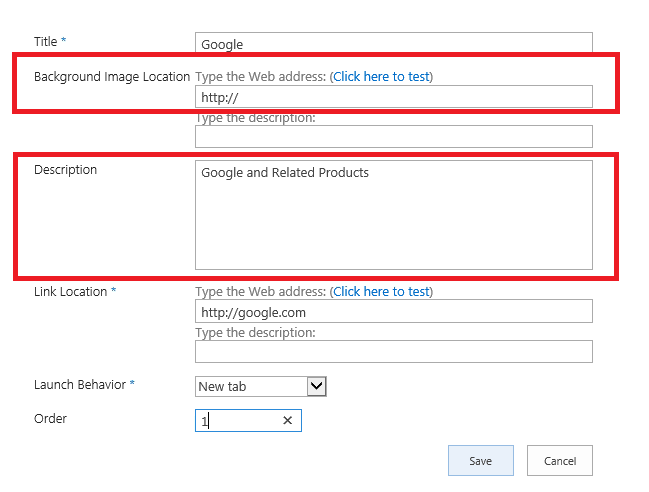 Select the value for Launch Behavior as New Tab so that the link opens in new tab. 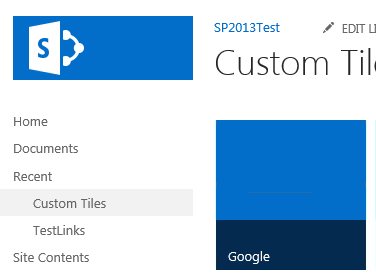 Also you can specify the order in which you want your tiles to appear. 8) This is your first custom Metro tile. 9) Repeat steps 6 and 7 again to have multiple tiles. 10) Browse to the Home Page of your site. Page -> Edit->Edit. 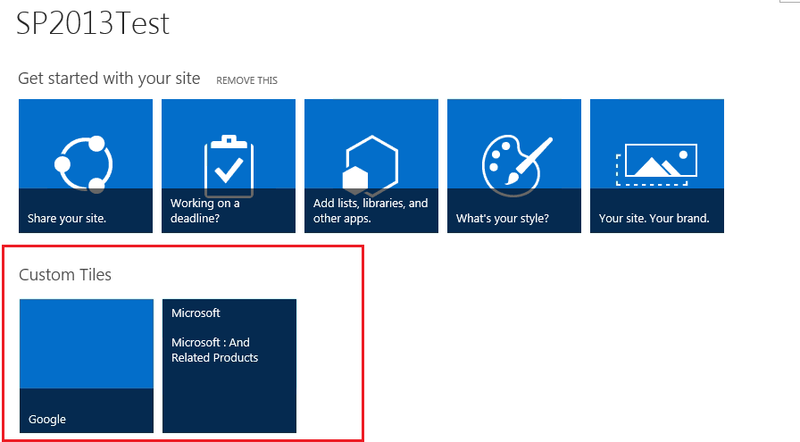 12) In the Apps section, select Custom Tiles from the existing list and Add. 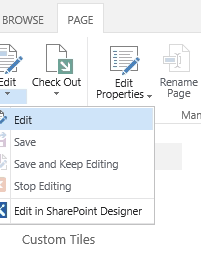 13) Once you add the web part, click Save to save the changes on the page. 15) You get to see your custom Metro tiles now. Good article but would like some pointers on how to customize. Please let me know what you are trying to customize. I'm trying to change the size of the tiles. I want them to be bigger. Then you can edit from there. How do we change the rollover color? Is it an image or CSS? Can we adjust the height of it or shape?